Discover the legends and myths surrounding the ancient Egyptian gods and goddesses such as Atum, the Sun god Ra, Isis, Osiris, Anubis and Horus that were worshipped by the Ancient Egyptians. The aim of this site is to provides facts and information about the ancient deities to enable kids and students to recognise and identify the different Egyptian gods in the mythology and art of ancient Egypt. Explanations and descriptions of the different symbols of Egyptian gods used in hieroglyphics and art are also available enabling kids and students to unravel the mysteries of the hieroglyphs displayed in the tombs and artefacts of ancient Egypt. Each article relating to the deities is accompanied by a fact sheet making the study of the deities and their symbols easy and informative. Kids and students will enjoy the ability to translate the images, art and pictures of the Egyptian gods and ancient Egypt and demonstrate a high level of understanding of the ancient deities, religion, goddesses and mythology of Ancient Egypt. The A - Z of Egyptian Gods provides fast access to interesting information and fast facts about ancient Egyptian Gods and Goddesses. Interesting Facts about the most famous deities, the major Egyptian gods of the collection of deities called the Ennead, the deities with the heads of animals, of the sky and of the Underworld. An article on Imhotep, the Egyptian architect who was deified as the god of medicine and healing after his death has also be included in our articles on Egyptian gods and goddesses. Osiris was one of the major ancient deities whose role was the god of the underworld and judge of the dead. Set, or Seth was the villain amongst the ancient Egyptian gods who murdered his brother Osiris and represented evil and darkness. The ancient Egyptian goddess Isis, the mother goddess, was the wife of Osiris and the mother of Horus one of the heroes of the ancient Egyptian gods who helped in the resurrection of Osiris. One of the most famous animal headed deities was the ibis-headed Thoth, the patron of scribes, writing and science and the inventor of the hieroglyphics. Anubis, the jackal-headed god was perhaps one of the most famous of the ancient deities and the god of the dead, tombs and embalming. Another of the famous animal headed Egyptian gods was Sobek the ancient crocodile god of strength and power. Bastet was one of the famous cat goddesses of ancient Egypt. 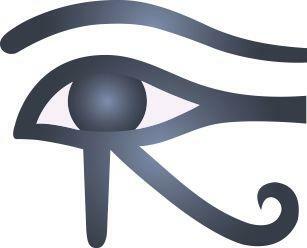 Magic surrounded the Egyptian gods and Heka was the god of Magic and Medicine. Heka was the son of Khnum, the ram-headed creator god of fertility. The scarab was an important symbol in ancient Egypt and one of the deities, Khepri, was depicted with the head of a scarab beetle. There were different creation myths in ancient Egypt that included the Ra and Ptah. The religious beliefs of the ancient Egyptians was based on an extraordinary number of ancient Egyptian gods and Egyptian goddesses. The characteristics and appearance of some of the ancient deities closely resembled humans. However, some of the deities were perceived as 'human hybrids' taking on the form and characteristics of animals such as the crocodile, jackal, ram or falcon. The bodies of these ancient deities were human but their heads adopted the appearance of birds and animals. 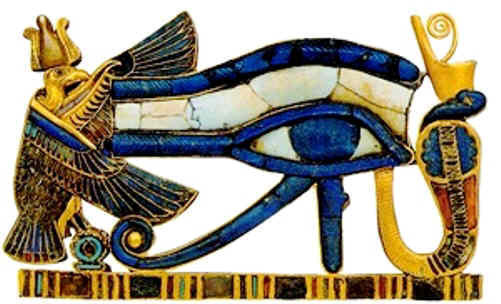 The worship of many divinities such as the Egyptian gods is called a polytheistic religion (as opposed to to monotheism, meaning the worship of one god). Read about the mysterious gods and goddesses of Ancient Egypt including the 'divine family' of ancient Egyptian gods. There were many Egyptian gods and Egyptian Goddesses. 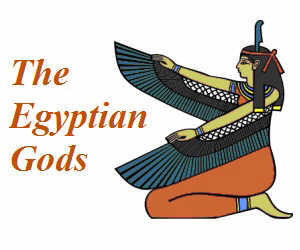 The article on Egyptian goddesses includes pictures and details in a chart containing a list of names with short descriptions of the goddesses with interesting facts and information. The pictures of ancient Egyptian gods and goddesses provide the meanings of their appearances and the symbols of associated with goddesses in ancient Egyptian art. The article on goddesses provides kids, schools and students with research information and clues enabling them to unravel the mysteries of the hieroglyphics of Egyptian gods and Egyptian goddesses displayed in the tombs, papyrus and artefacts of ancient Egypt. 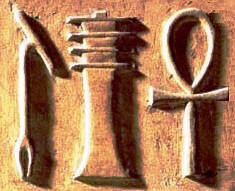 Other symbols associated with deities included the Ankh symbol that represented eternal life. The pillar-like symbol called a Djed that was used in in hieroglyphics representing stability and can be seen in many images of Egyptian gods. The long staff, called a 'was' sceptre was depicted with many Egyptian gods and goddesses and believed to embody magical powers, symbolizing divine power and was an emblem of authority. The strange depictions of a human head on a bird represented the part of the soul called the Ka and Ba and depicted in scenes from papyrus such as the Book of the Dead, differentiating a human from the gods of the Underworld. The famous Scarab Beetle, seen on so many charms, amulets and the jewelry of the Egyptian gods of ancient Egypt, was a sacred symbol of regeneration and creation of the Egyptian gods conveying ideas of transformation and resurrection. The Tree of Life an important myth relating to the deities symbolized Knowledge of the Divine Plan and was the equivalent to a map of destiny. Lotus flowers, water lilies, symbolized rebirth and regeneration which are all detailed in this website. The many different Crowns and head-dresses that adorned ancient deities were symbols of power and status. The Rearing Cobra symbol, called the uraeus was the symbol of the Pharaohs of Lower Egypt and adorned the royal crowns and the headdresses of Egyptian gods. The Uraeus symbol was associated with the sun and protection and depicted on the crowns of many deities and the pharaohs and kings of Egypt. There were over 2000 deities in ancient Egypt. The major Egyptian gods and goddesses were worshipped throughout the whole of Egypt and numbered less than one hundred but many minor gods that had just a local following. The worship of deities was developed by ancient tribes in different regions of Egypt. As the ancient Egyptian civilization and culture developed a national religion was established. The national religion of ancient Egypt was subject to many changes and the status of Egyptian gods and goddesses changed according the dominant political regions and cities of Ancient Egypt. 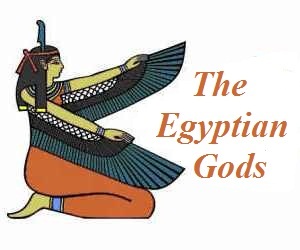 We have provided names with a list and pictures of the major Egyptian gods and goddesses. In ancient Egyptian mythology the assembly of nine Egyptian Sun Gods of the cosmogony of Heliopolis were collectively called the Ennead. The cosmogony is the myth that explained the origin of the universe and man. The Ancient Egyptians believed that Heliopolis was the birthplace of the Ennead gods and deities. The names of the nine Egyptian gods and deities of the Ennead were Atum (the Sun God Ra), Geb, Isis, Osiris, Nephthys, Nut, Set, Shu and Tefnut.